It is reported that founder director of Apple Industries, Steve Jobs, met Haidakhan Babaji in India. 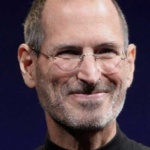 Jobs died from pancreatic cancer in 2011. Recently his friend Daniel Kottke, who went on to join Jobs at Apple Computers, states that he and Jobs were initiated by Babaji in Haidakhan in 1974. They had flown to India to meet Neem Karoli Baba in the Kumaon Hills of India. But Neem Karoli Baba had just taken samadhi and Jobs and Kottke were advised to travel further to visit Haidakhan Babaji. According to the official Biography of Jobs by Walter Isaacson: Jobs visited the ashrama of Haidakhan Babaji for spiritual enlightenment. Steve Jobs planned every detail of his own memorial service, held at Stanford University in October 2011, including the brown box each attendee received as a farewell gift. In it was a copy of “Autobiography of a Yogi” by Paramahansa Yogananda. He practiced meditation regularly during his life. It is claimed that he believed that he received inspiration and knowledge during his meditations and that these have transformed our world.